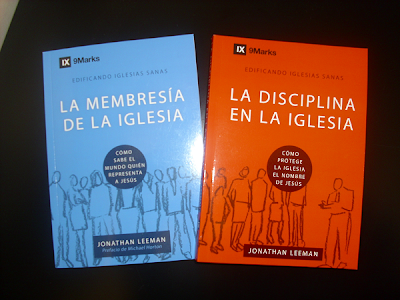 The new 9 Marks web page in Spanish and two new books from 9 Marks in were launched at The Gospel Coalition conference in Orlando, Florida. Over the past year and a half, Peter has been working with Patricio Ledesma and 9 Marks to coordinating the translation of the 9 Marks web page into Spanish. Javi Perez has done a great job in translating these two books into Spanish. Little by little a team is forming to get more of the books, articles and ejournals into Spanish. We are thankful that it worked out for Patricio to actually attend the conference and meet with the Spanish pastors that were in attendance. Here are the two books that were given to the Spanish pastors.